At Code Three Fire & Alarm, we offer expert fire suppression system design, installation, and modification services in Fairfield, Suisun City, Vacaville, Napa, Vallejo, Concord, Antioch, and surrounding cities at highly competitive rates. We hold a C-16 State Contractor License for Fire Protection Engineering as well as a license from the State Fire Marshal. We have more than two decades of experience custom designing, installing, and modifying fire protection systems for general contractors, restaurant owners, and chefs, and thousands of satisfied customers. We'll make sure that you get the right fire protection system for your equipment and its specific application. 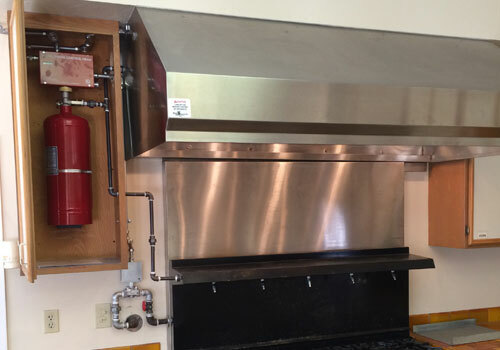 When properly designed, installed, and maintained, a fire suppression system offers the fastest and most effective way to put out a kitchen fire, which is fire suppression systems are required by state and federal law to be installed in restaurants, food trucks, commercial kitchens, and most healthcare facilities (e.g. hospitals, nursing homes, convalescent homes, and retirement communities). Because most auto body shops use flammable spray paint finishing, OSHA requires that all spray paint booths have either a fire suppression system or fire sprinkler system. However, unlike a kitchen or restaurant hood fire suppression system which uses a liquid agent, a spray booth fire suppression system typically uses a dry chemical agent. Fire suppression systems can usually be activated manually from a remote pull station as well as automatically with the use of a fusible detection device. A fusible detection device only triggers the system if a high enough temperature is reached. Once activated, the fire suppression system shuts off the gas valve and electrical power and sprays a fire retardant chemical directly onto the fire to put it out. The dumped fire retardant also creates a vapor blanket which prevents the fire from reflashing. To get started, Code Three Fire and Safety offers a free on-site consultation with every commercial kitchen, paint booth, or restaurant fire suppression system installation or modification project. During this site visit, we consider the layout of your kitchen or other space, the width and length of the hood, the number and type of cooking components (charbroiler, fryer, flat griddle, stove, etc.) underneath the hood, size of the gas valves, presence of any electrical equipment, and more. We then create a custom fire suppression system blueprint with piping diagram and nozzle specifications to support your specific needs. Once we know what type of system is required, we can take into consideration the available products on the market, the price, availability, and overall performance, before providing brand recommendations. We are a certified distributor for today's leading brands: Ansul, Pyro-Chem, Amerex, Badger, and Range Guard. By offering several lines, we are able to offer affordable solutions for a wide range of budgets and needs. After the fire suppression system is selected, we can submit the plans to the local authority for approval. The turnaround time for approval can be instant or take as long as two weeks. Once approved, we ensure that we have all the materials ordered and schedule installation. Installation is completed in less than a day, and inspections can usually be scheduled for later in the afternoon or first thing the following day. All work is done to code and guaranteed with a one-year parts and labor warranty. If at any point changes are made to the layout of your cooking equipment, you'll need to call Code Three Fire and Safety to discuss modifying your fire suppression system and re-submitting it to the local jurisdiction for approval. Additionally, we repair and service fire suppression systems. Click here to learn more. Our staff is extremely knowledgeable, and we maintain a large inventory of component parts, such as nozzles, fusible links, and mechanical control heads, and chemicals. Call locally owned Code Three Fire and Safety today to schedule your free on-site consultation. We welcome commercial fire suppression system design, installation, and modification jobs throughout Fairfield, Suisun City, Vacaville, Napa, Concord, Antioch, Vallejo, Rio Vista, Pinole, and surrounding cities. Our normal business hours are 8:00 am to 5:00 pm , Monday through Friday. We accept cash, check, MasterCard, Visa, and American Express. We provide free upfront quotes and keep our prices very competitive. 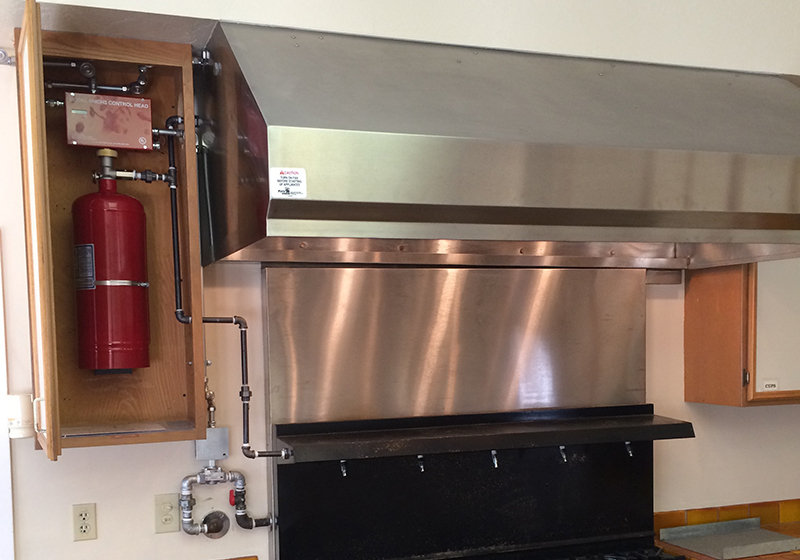 Properly installed and well-maintained fire suppression systems are the most effective way to put out kitchen fires. We help our clients design a restaurant hood fire suppression system that fits their needs and meets state and federal codes.